New Infrastructure Intelligence/Deltek Pulse survey reveals the issues driving infrastructure professionals. 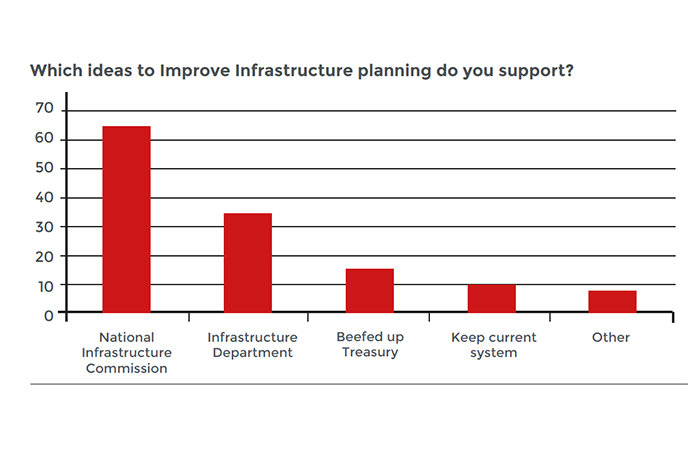 As the Conservative government begins a new 5 year term infrastructure leaders urge David Cameron to make infrastructure planning more strategic and long term in the new Infrastructure Intelligence/Deltek Pulse survey. “Like health and education infrastructure should be considered outside of politics,” said the CEO of a consulting firm participating in the first ever Infrastructure Intelligence Pulse survey in association with global business software firm Deltek. Like many of the other 120 business leaders that took part in the research he called for the new government to take a much longer term view of infrastructure needs that would give more certainty and stability to the country and the industry. “Government should set a clear framework, with clear policies and let the industry do what it is good at,” said another senior professional working for a client organisation. Labour would be a better choice with only 13 % were planning to vote for them. Liberal Democrats were more popular than Labour with 14% of the overall vote despite the party only considered best for infrastructure by 3% of business leaders. However it was the need to improve infrastructure planning that dominated the views of professionals when asked what single thing the new government should do to improve business life. 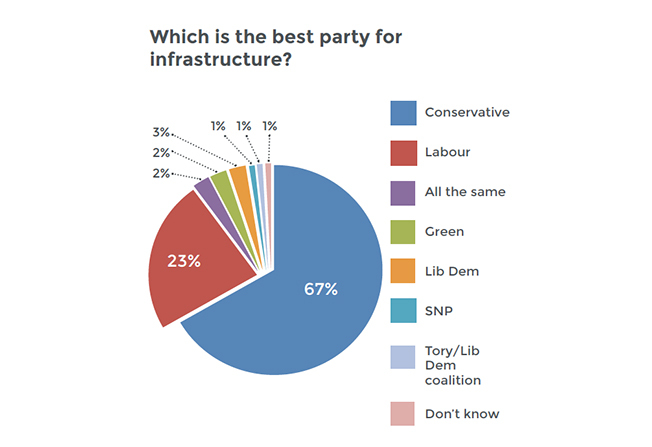 To support this more than half, 54% said that they supported the establishment of an independent Infrastructure Commission as proposed by Sir John Armitt and backed by Labour. A further 29% supported plans for a Department for Infrastructure within the new government. “Infrastructure planning should be independent of Government and Treasury, like the Bank of England, and staffed by people who understand the country’s infrastructure needs as well as the technical constraints of delivery,” said a business manager. “We need to plan and provide in a manner which is accountable and breaks down departmental barriers. So far Armitt’s is only proposal that ensures this whilst maintaining political oversight,” said another consultant at manager level. As the UK moves forward under a new government, infrastructure industry leaders want to see momentum on infrastructure investment maintained along with improvements in the economy. 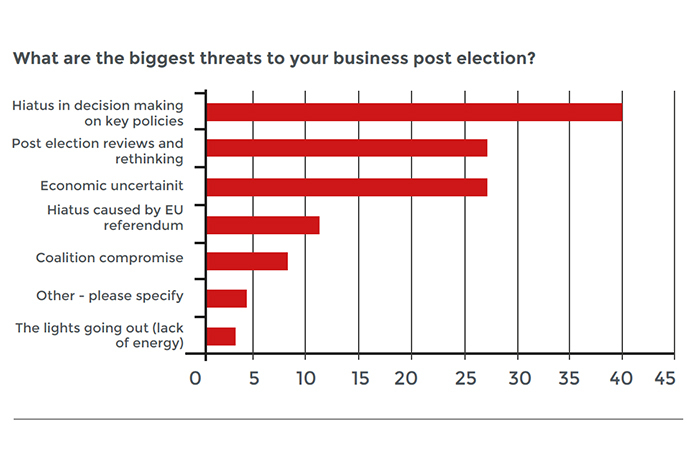 Fears over a hiatus in decision making, post election reviews and economic uncertainty were their biggest concerns. Others echoed the views. “A lot of work has already been done and has allowed the UK economy to gain momentum and both local and foreign investment through market confidence. Any immediate rethinking will lose momentum and confidence,” said a consultancy CEO. Survey respondents also highlighted that better planning for infrastructure could enable industry to better meet the skills challenge and urged the new government to promote a quality based procurement agenda with good design judgement at its heart. “The new government must understand that they have a huge role to play in both smoothing the flow of work into the industry and in leading the way in value led procurement. Both have a profound effect on the shape of the industry and the levels of investment that can be afforded,” said a consulting CEO. Several respondents also urged the new government to make public contracts more accessible to SMEs. Not surprisingly business leaders said that the new government should press ahead with High Speed 2 with 77% supporting the scheme and 16% calling for a review. 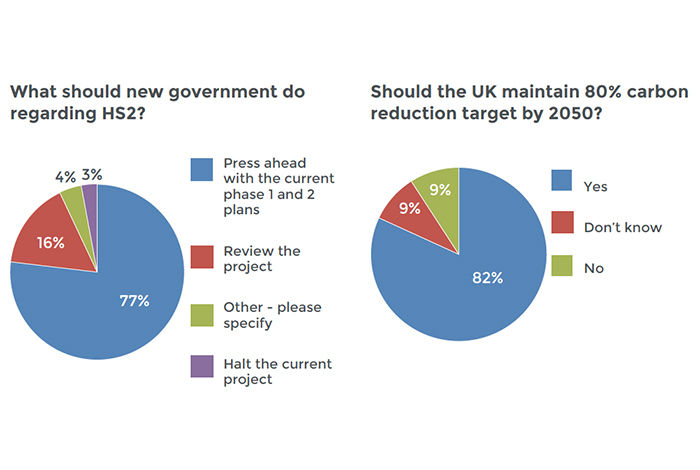 On carbon reduction targets 88% of the professionals believed that the UK should maintain its commitment to carbon reduction of 80% by 2050. “It’s called progress and we should strive to stay ahead of the evolutionary curve. If my children aren’t driving electric cars or using public transport in 2050, I will be disappointed. We have plenty of time to make it happen. The danger is that we procrastinate and don’t map out an effective plan” said a business manager from a consulting firm. “This is the reason why we need new, smarter infrastructure, and not allow arguments to flourish that we should stop,” said another. Suggestions that the UK works wholeheartedly to become a world leader on renewable was another key suggestion to the new government with concerns over power capacity also being among post election threats. “Lack of energy is a real tactical risk to business operation that has been raised for a number of years. The historic opportunity to mitigate this risk through effective UK energy policy and planning has to some degree gone, we are now potentially at the mercy of geo-political uncertainty and long term volatile weather patterns,” said a client side business manager. Looking ahead then the new government faces a plethora of major challenges not least the need to maintain economic stability and cut the deficit. But as the Pulse survey highlights having a long term, cross sector, strategic view on infrastructure investment can stimulate and support sustainable growth and international competitiveness. With schemes such as the Thames Tideway, Crossrail, HS2, major road programmes and housing schemes already underway and new energy generation, road, rail, housing and aviation capacity desperately needed, the message to the new government is maintain the momentum and don’t stop now. 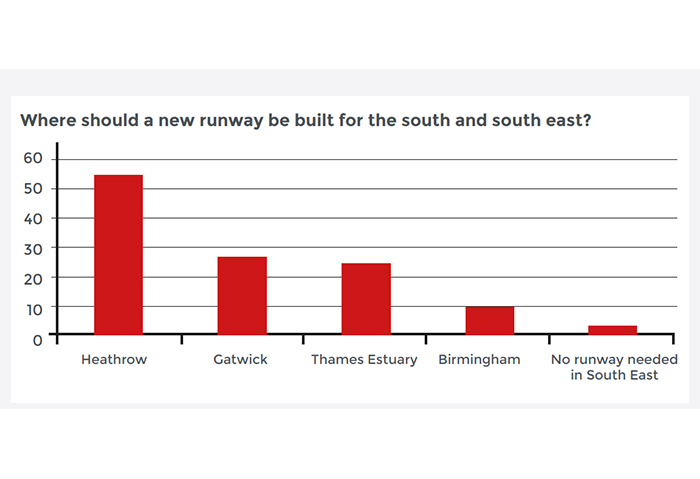 On aviation 46% of business leaders said new capacity for the south should be provided at Heathrow, 22.5% voted for Gatwick and 20% maintain support for a new Thames Estuary airport. However several respondents called for expansion at both Heathrow and Gatwick.